The Fred Hutchinson Cancer Research Center is looking for participants in a support group study. 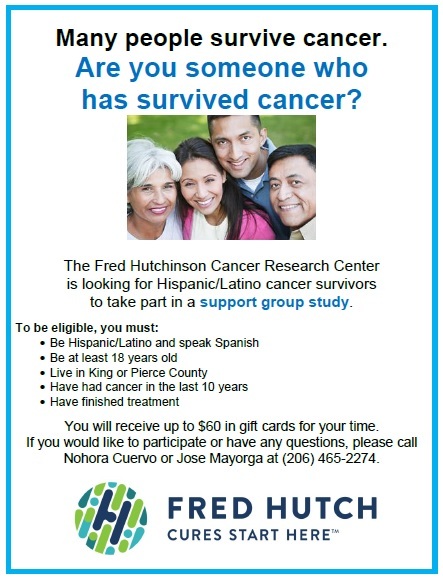 This is open to Hispanic and Latino cancer survivors who live in King or Pierce County and are over 18 years old. You would receive up to $60 in gift cards in return for participating. For more information or to sign up, professional ed contact Nohora Cuervo or Jose Mayorga at (206) 465-2274. This entry was posted in Newsletter on October 14, 2015 by Hayley McKie.